Eau Bleue was the first stop of the day although our driver was not keen to take us there. He explained that it was very dangerous to reach the falls and that we needed suitable footwear for the climb down. Eau Bleue is very well hidden in a valley behind trees near the town of Curepipe. The only way to reach it is via a climb down a vertical embankment. As I clung on to tree roots I understood why our lovely driver was reluctant to stop at Eau Bleue. It was an adventure in itself getting down to the falls, you wouldn’t even know it was there from the road. There was no one else at Eau Bleue, I presume it’s either not that well-known or people are put off by the climb down; which is totally understandable. This waterfall is stunning with the bluest water I have ever seen. If you do want to find it, please take care and wear sensible footwear; flip-flops are a definite no for the climb. We initially got lost amongst a sugar cane field on a bumpy dirt track when trying to find Rochester Falls. But with the help of Google maps it didn’t take too long to find it. We followed a path through sugar cane and down a very muddy uneven slope. Flip flops swiftly removed, it was a case of getting muddy feet to get down to the falls. Once at the bottom a local man was waiting to help us cross over a stream to reach the waterfall. We quickly realised we were going to have to pay him, so be wary of this and make sure you have some cash. He has a fruit stall by the falls so we were happy to have fresh coconut water and pineapple slices. He also took us behind the falls, which I wouldn’t advise if you aren’t confident in the water. I love the water but did not enjoy going behind the falls. There was no space to really get behind the constant flow of water and with it continuously pouring over my face it felt a bit like I was drowning! Still, it’s an experience I can tick off my list! He also showed us where the safest spot to jump off the edge of the falls was, it was great fun. The mini tour of the falls, plus fruit was of course going to cost us some money as already mentioned and our friendly gentleman wanted more than we were willing to pay him. We settled on £4 each and thanked him for looking after us. It’s worth remembering that if someone is there waiting to help you cross the stream you don’t necessarily need to commit. The river is easy to cross by yourself, so don’t feel you need to pay any money for help if you don’t want to. Behind Rochester Falls-me not having so much fun! This beauty is as tall as the Statue of Liberty and a lot easier to view than Eau Bleue and Rochester Falls. Cascading into a deep cavern it is found in Black River Gorges National Park. See it from viewing platforms or take a trail to the bottom for a swim in the refreshing water. This one is probably the busiest out of the three in terms of tourists as it easier to reach the view points. Plan a stop at the sacred lake Grand Bassin or Ganga Talao as it is also known. This Hindu place of worship is considered to be the most important in Mauritius. A yearly pilgrimage takes place with people walking for miles across the island to gather in worship. Colourful temples and Hindu Gods and Goddesses line the lake. Step inside the main temple and receive a blessing from a Hindu priest; leave a voluntary donation on exiting. Out of respect remember to remove shoes before entering and dress modestly. Stop by the huge statue of the Hindu God Shiva and his wife on the outskirts of the lake. Shiva stands at 33 metres high and is the tallest statue in Mauritius. The beach at Le Morne can be found on a peninsula on the south-western coast at the foot of Le Morne Brabant mountain. This beach makes a great stop off for a refreshing dip after a day of exploring the island. Crystal clear waters and a long strip of golden sand, it is one of my favourites. The famous Le Morne Brabant is a UNESCO Would Heritage Site. Legend states that it was home to a group of runaway slaves who hid in their hundreds on the mountainside. When slavery was abolished in Mauritius on 1st February 1835 police officers were sent to Le Morne to make the slaves aware of their liberation. On sighting of the officers the slaves feared they would be recaptured and very sadly chose to jump to their deaths from the mountainside. It is incredible to see Le Morne up close and sad to think of the ancient myth that surrounds it. The legend is a big part of Mauritian culture and today a monument sits at the base of Le Morne in homage to the slaves. For more adventures in Mauritius head to my blog post: 11 things to do in Mauritius… and Swimming with Dolphins in Mauritius. 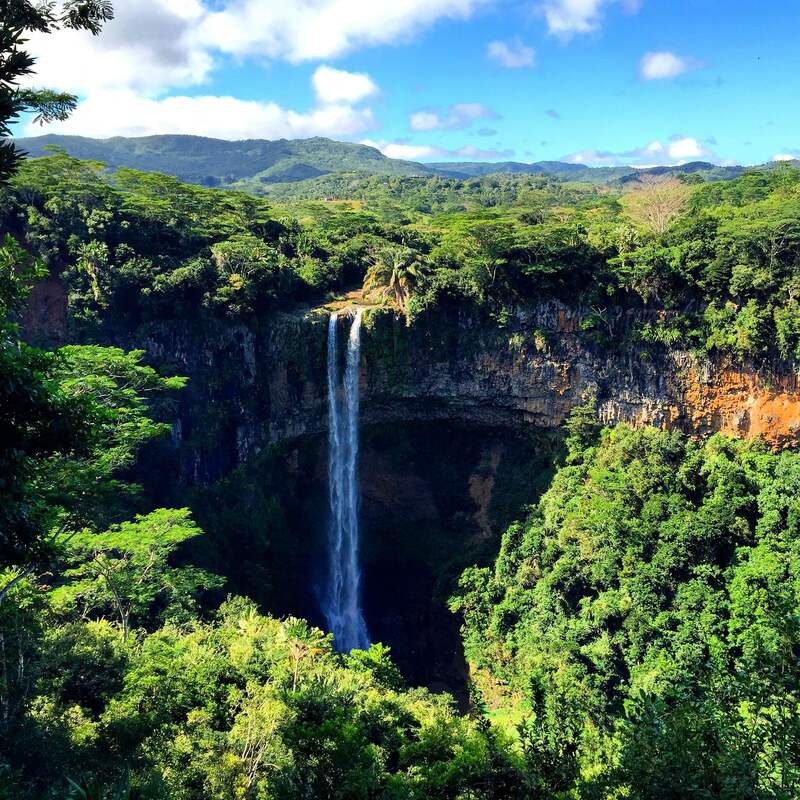 Mauritius looks gorgeous, especially the waterfalls! Thanks Claire, it was beautiful out there!